Have you ever seen the ‘I Love Lucy’ episode where Lucy decorates the apartment “cuban style” because she thought Ricky was homesick? Well, I am not crazy like Lucy but I did decide it was time to bring some Tex-Mex into this Italian home. One thing I miss very much (besides my family and friends) is Tex-Mex food!!!! I have been thinking about Tortillas and Guacamole for 2-1/2 months now. Now that I found my little Mexican shop, I figured it was time to put my cooking skills to use. Today, I invited the Sister Missionaries to come over for dinner. It’s been a while since I cooked anything besides Pizza and Crostata so, I wanted to start slow. I made Nachos, but not just plain Tortilla Chips and Cheese… nope.. These are fancy shmancy Rachael Ray Nachos. So, I went to the Mexican market today to buy my ingredients. First, where the Chips. If you look closely, you can see the price is € 3,50 which is about $5.25 for this bag!!! That’s pretty good compared to what is available at the grocery store. 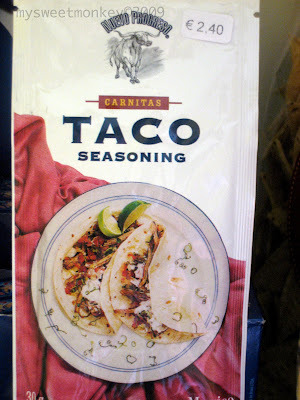 I also picked up a packet of Taco Seasonings. € 2,40 which is… $3.60!!! FOR A PACKET OF TACO SEASONINGS!!! Expensive… I know! So, as I was purchasing my items, I remembered that Carlo had asked me to buy a Cross. 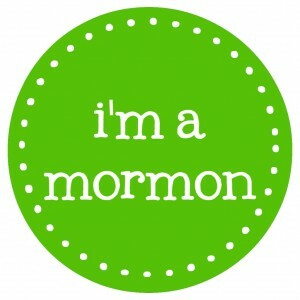 Now, because I am LDS and Carlo is Catholic, we had to come up with some sort of compromise. He wanted a Crucifix and I said that I would rather look at a nice cross instead. So, I got a Cross. Since my new friend at the Mexican market is infact, Mexican, I asked her if she knew somewhere I could buy Cumin. She directed me to a shop a couple of doors down that sell spices. Now, in a previous post, I mentioned that I found some Cumin in the Asian shops. Well, the Asian shops are located in a “not safe for a girl walking alone” neighborhood. So, I was really happy to hear that there’s another alternative. Unfortunately, this store doesn’t sell Ground Cumin.. only Cumin seeds, but it’s better than nothing. So.. I bought some too. So, I went home to relax when I remembered that I had to go to the store to buy Avocados. So, I walk to the store but I decided to stop by Upim first. I shouldn’t have done that!! I found some really cute bowls and small plates that would be ideal for desserts. I would like to thank my Mom and Dad for this!! This is what I bought with the birthday money they put in my account! Once I got home, I put away my groceries, took pictures of course of all the stuff I bought. As I was preparing the meal, I notice how beautiful it was out side. I don’t remember the last time I saw a really beautiful sunset. So, I took a picture. As it got close to 7:30, I finished the Nachos and waited for my guests to arrive so that I could put them under the Broiler for the cheese to melt. I also made some Guacamole to go along with our yumm-o Nachos. Of course, I had to display my new dishes while serving dessert. Now that I’ve got almost everything I need, I won’t feel so homesick for Tex-Mex food. Although…… a nice big bowl of Menudo sounds good right now! I just have to say ewww to menudo! but everything you made looked really good! I like the sunset pic. WOW! 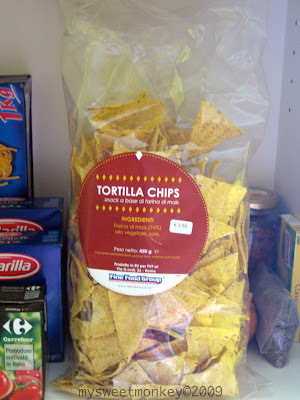 The Mexican ingredients are EXPENSIVE! You’ll have to make your own Taco Seasoning. I use Chili Pwd. Cumin, Garlic, Sal, y Pwd. Onions. 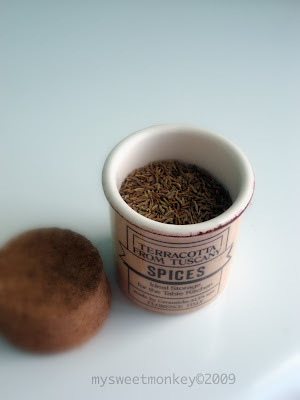 As for the cumin seeds, you’ll need a molcajete like mine and abuelita’s and bisabuelitas. Your food looks delicioso! Your new dishes look very fancy with the postre. Great pictures, look like you would see in a magazine (revista) Super, Super Bello! La Cruz esta bonita. The only reason I bought Taco Seasonings is because I wasn’t going to get Cumin at the “not safe” Asian store. It wasn’t until I bought my stuff and was on my way out that I decided to ask the girl about finding it somewhere else…. and I thought it would be tacky of me to tell her that I don’t need her Taco Seasonings. I usually make my own too. Ohhhhhhhhhh! That’s like the time , your father and I went to Terry’s El Mariachi to buy rice pudding. it was on sale for .89 centavos. I saw Yolanda, and she asked me, oh that’s real easy to make, don’t you know how to make it? I said yes, but It’s on sale, besides I didn’t want to leave without buying anything. I should have told her, I want to eat it in the car, not wait to go home and take 2 hrs. to make. Tanti Baci! That guac looked YUMMY!!!! I am so glad you are able to find things that remind you of home.